Vivid Green was recently commissioned by a family in Kingston Upon Thames to transform an unused area of their garden that housed two old sheds, into space where the family could spend time and entertain friends. Vivid Green’s client had a clear vision for their garden room and had drawn up a plan showing how they wanted to incorporate two sets of bi-fold doors into the main room and some covered outside space to create inside-outside living. The Vivid Green team were happy to use this as the basis of the finalised design. As well as creating space for entertaining, the building also needed to incorporate some discreet storage. The Vivid Green team had plenty of space to play with, to incorporate these requirements. The L-shaped garden room sits on a footprint of 8m x 8m x 4m. There were no access issues, and the site was relatively level. A tree was removed from the site though, rather than build around it. The Vivid Green team handled the groundworks for the project as well as the installation of the garden room structure. 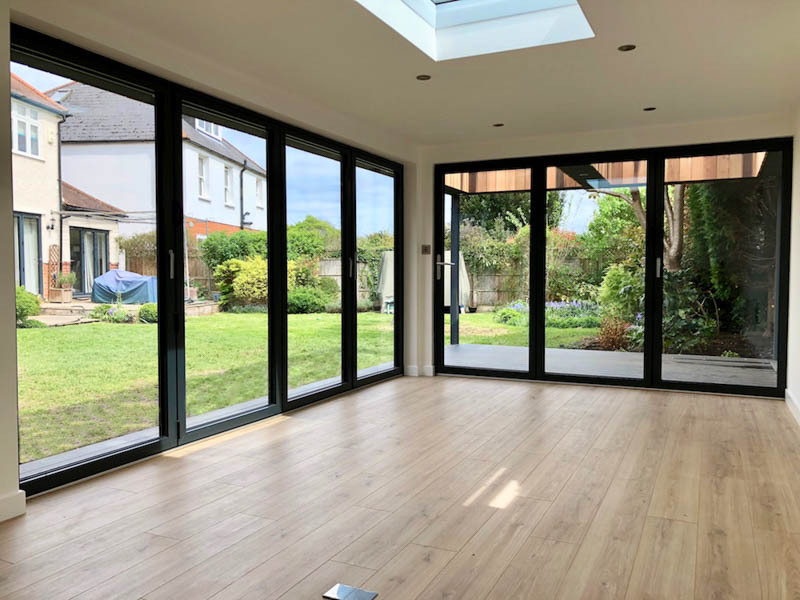 The main room features two sets of bi-fold doors which fold back to open up the walls onto the garden. This creates the flowing inside-outside space the client was looking for. A large skylight has been fitted in the roof of the main room, letting in additional natural light. These windows are great for framing a view of the sky and watching the clouds go by! The bi-fold doors at the end of the room lead onto a covered outdoor seating area. A solid wall clad in Cedar runs along one side of this outside space, supporting the roof canopy. This canopy is cleverly designed with both solid and open sections, which combine to allow light in and to cast shadow. A low maintenance, composite deck, has been fitted in this area. The shorter wing of this L-shaped garden room houses a large storage shed. The entrance to this storage area is hidden within the Cedar clad wall. The room is fully wired electrically. The electrical specification includes Cat6 cabling to ensure that the room has a high-speed internet connection. The lighting and heating system has been designed so that it can be controlled via a smartphone app. 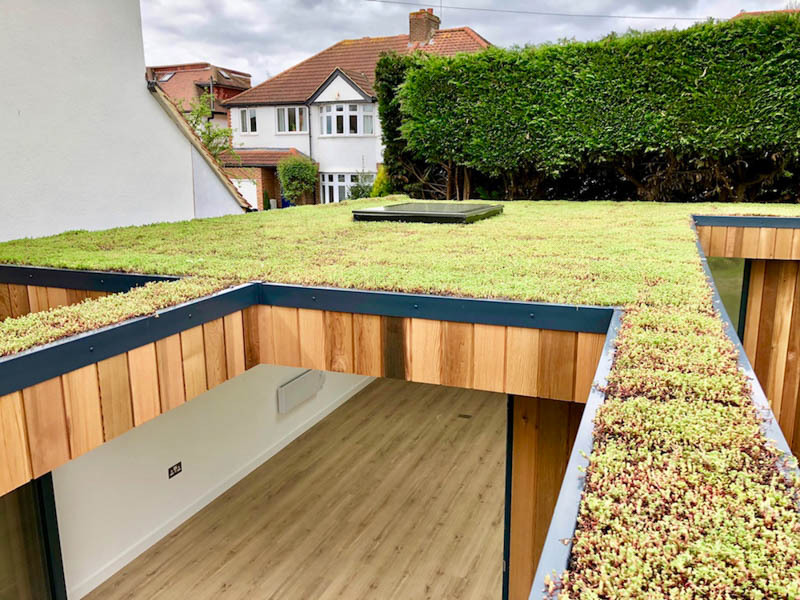 As we can see, the garden room looks great from above, thanks to the sedum roof covering which runs across the whole building. This large garden room took around a month to build and cost in the region of £55,000 including the groundworks. To learn more about this project talk to Vivid Green on 0800 051 8366. Take a look at www.vividgreen.co.uk to see more of their work.